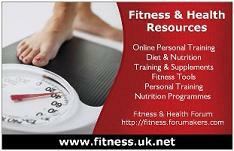 Ok the website has been updated recently with a new online training page explaining exactly how the online training works and also a redesign of the personal training section as we have now become affiliated with Inspired Personal training. This means that the fitness.uk.net trainers will be concentrating on online training and support and personal training in the worcestershire area will be carried out bu Inspired PT. Im also experimenting with the logo hence the reason it keeps changing! I'd like to see more tools to play with. Like the BMI tool and stuff. That would be sweet! I will have a look and see what I can do! Im still working on this!